A move to Switzerland when the franc is running rings around the pound seems rash at first glance, but the organisers (Momentum Ski) have struck deals so that prices have remained the same (from £595 for three days including flights, transfers, accommodation, breakfast, lunches, racing and parties). They’ve also arranged a flight to Sion, half an hour from Crans. (Unless you’ve booked, you’re too late – it’s full, so you’ll fly to Geneva, two hours away.) Crans – so the tourist office chiefs declared at last week’s launch – has made it a priority to increase its Brit-count, and targeting an upmarket crowd seems no bad idea. As was revealed at Crystal’s Ski Industry Report this week, the corporate and high-end markets are recovering. The festival element involves Marcus Brigstocke, who founded Meribel’s Altitude Festival. 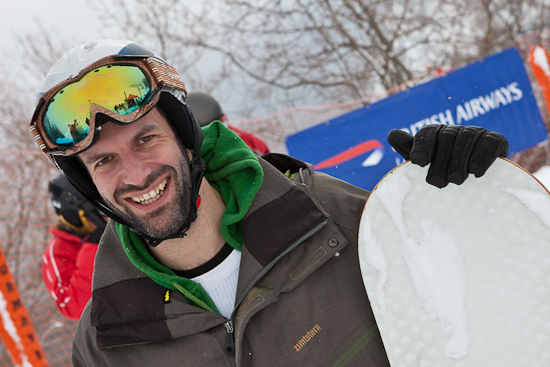 At the 2011 City Champs, Brigstocke’s stand-up went down well – and he completed the race, too, by snowboard. There will be live music and comedy every night: “We want to open up the weekend to those who like the idea of an alpine party,” Amin Momen, Momentum boss, said. 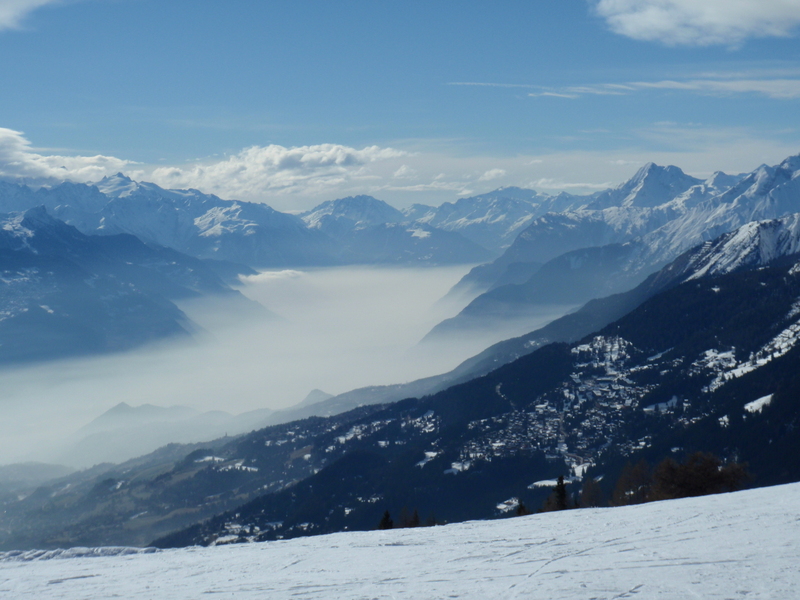 I skied at Crans last winter, visiting from neighbouring Anzere. On past outings I haven’t had the best impression, due to my own poor sense of direction: twice in the 1990s I mislaid my car there, as the base stations of the telecabins from Crans, Montana and Aminona – villages strung along the south-facing hill – look similar to me, and there is a car park at each. This January, however, I went with my dad, who isn’t prone to this sort of idiocy. We went to ski with several of his farming clients, who were there on a “boys’ weekend”. It was a clear, freezing day and the view southwards across the Valaisan Alps and Italy, towards Mont Blanc in the west and to central Switzerland to the east, was at its most glorious. Even as a regular at Anzere, where the view is just as magnificent, this panorama still takes my breath away. 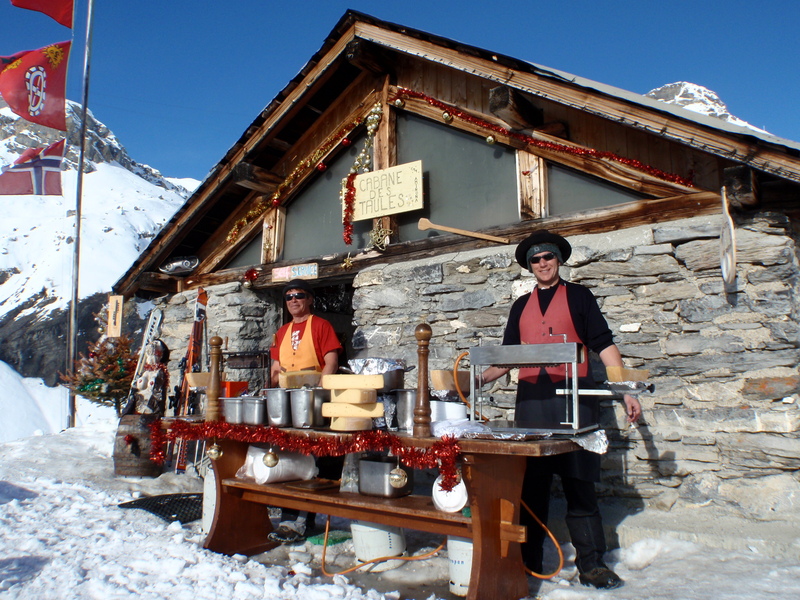 We had cheese fondue for lunch at Chetzeron (2,112m), a restaurant and mountain hotel that re-opened in 2009/10 after refurbishment: it used to share its site with a cable car station. Now it has a glass-sided terrace, lounge bar, sunloungers and a lot of sheepskin. You could spend all day there – and I’ve no doubt some of the City Ski-ers will do so. I reckon they’ll also love the less chi-chi spots – such as the Cabane des Taules, a cowshed where we stopped for vin chaud and where raclette is the specialite de la maison. And the skiing? My favourite run was from Chetzeron to the village, down the women’s downhill course, whose bumps, dips and bends through the pine forest make for an exhilarating ride. Catch it when it’s empty and well prepared and you’ll struggle to find a better piste to bomb down. We enjoyed the descent from the glacier, and could see plenty of off-piste potential mid-mountain. Despite no snow for weeks during our visit we found nice, accessible stretches of packed, tracked powder – I suspect most skiers here stick to the pistes and restaurants (after all, Italians are the most numerous visitors here after the Swiss). Crans also knows how to stage races. In 1987 Peter Mueller and Maria Walliser were downhill winners at the World Championships and the mountain has held numerous world-class competitions since then. Next winter, the World Cup men’s giant slalom returns, and during our visit the Junior World Championships were in full swing. I can’t pretend to know the village well – I do know there is good shopping (my current ski jacket comes from Crans) and I’ve been to the cinema there a few times. But I understand night-spots – a crucial ingredient for City Ski – are plentiful. And while the village can’t beat Courmayeur for traditional charm, I think other things will win over – speedy routes up the mountain, snow-sure pistes to the village, panoramic views and a well-organised competition infrastructure. By the way, anyone can go – you don’t need to be a sharp-shooter in pinstripes. My team-mates in March were an employee of Arsenal Football Club, an indoor golf salesman and the Ski Club of GB’s PR consultant. And you don’t need to be terribly experienced: some racers were putting in extra turns between the GS gates in March – and they received only encouragement. After all, the organisers do bill this event “competition in its friendliest format”.